On to happier things — food! This past couple of weeks have been chilly. Very chilly for August. I think the fall weather is approaching a bit early this year. And as such, I made a pot of stew. Sounds so good on those gloomy cold days. I love to curl up on the couch with a bowl and watch some TV or movies. For the stew, I went with an amber lager but feel free to use your favorite quality beer. None of those Budweiser or Coors Light yucky stuff. 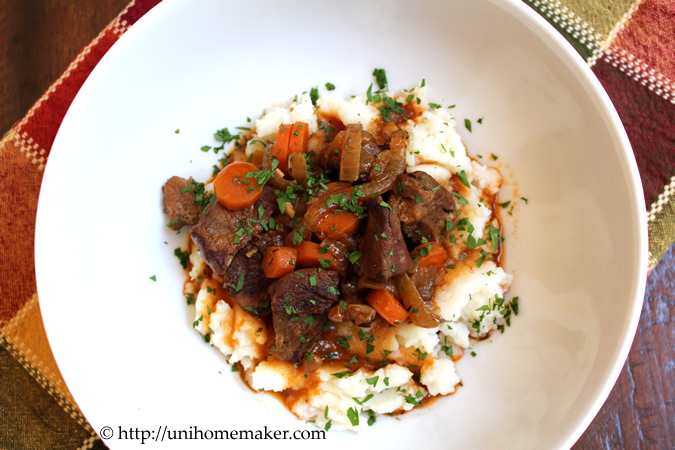 This stew has so much flavor and is fabulous with mashed potatoes. Enjoy your week! Season beef with salt and pepper. Toss to combine. 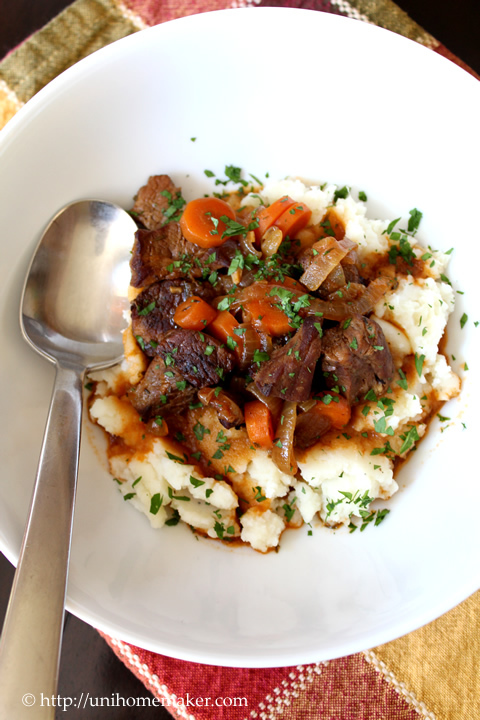 In a large Dutch oven over medium high heat, add olive oil and beef. Work in batches and brown meat, about 5-7 minutes. Transfer browned meat to large bowl and repeat until all the meat is browned. In the same pot, add butter, onions and garlic. Cook until onions soften, about 5 minutes. Reduce heat to medium and sprinkle in sugar. Continue to cook onion and stir occasionally until golden brown, about 15 minutes. Add flour, thyme, bay leaf and carrots. Raise the heat to medium high and continue to cook for 1-2 minutes. Pour in lager and let it come to a bubble then stir in broth and tomato paste and let it come to a boil. Return stew meat and any accumulated juices in the bowl back to the pot and let it come to a bubble then reduce the heat to low. Cover and simmer until stew meat is tender, about 1 hour. Discard bay leaf and check for seasoning, if needed. 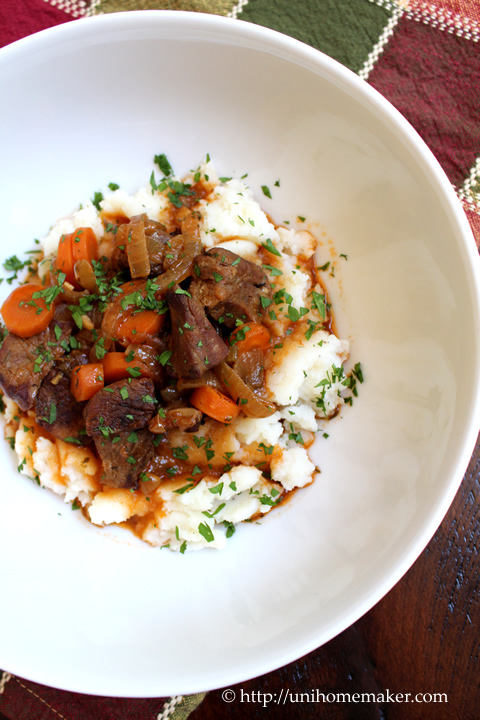 Ladle stew into a bowl and garnish with parsley. 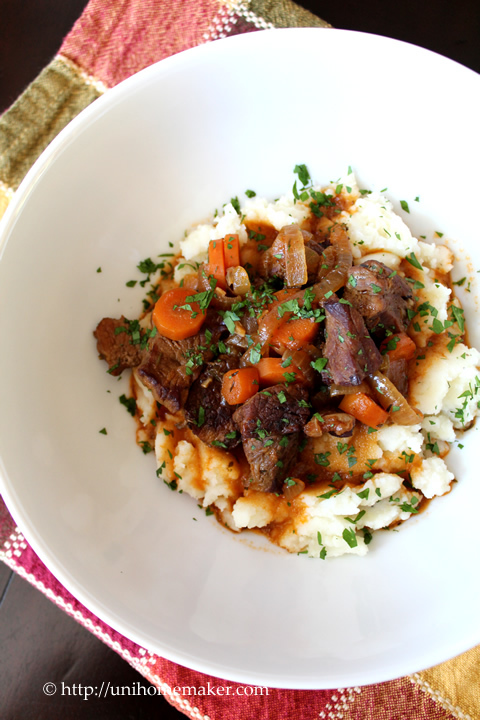 Serve with mashed potatoes or crusty bread. Oh no, I don’t even know what a hidden frame is! How did you figure it out? 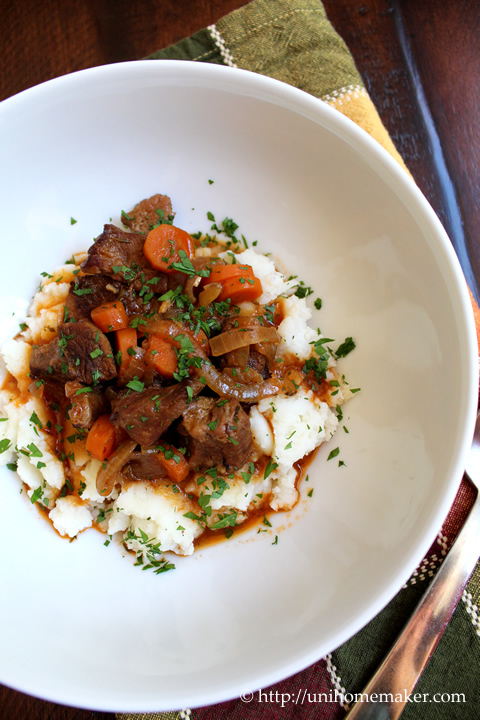 This looks delicious, what a great idea to serve the stew over mashed potatoes.